b) when I consulted Brian who lived in Brazil for several years, he said he had never tasted anything like this. Now, granted, the country of Brazil is crazy humongous so there’s a really high likelihood he was stuck in the southern part of the country and missed out on this kind of goodness, but there’s also a really high likelihood that it’s just a fancy name for blender limeade. No matter. The stuff is freakishly delicious. As in, I think it’s my favorite drink in the history of ever. 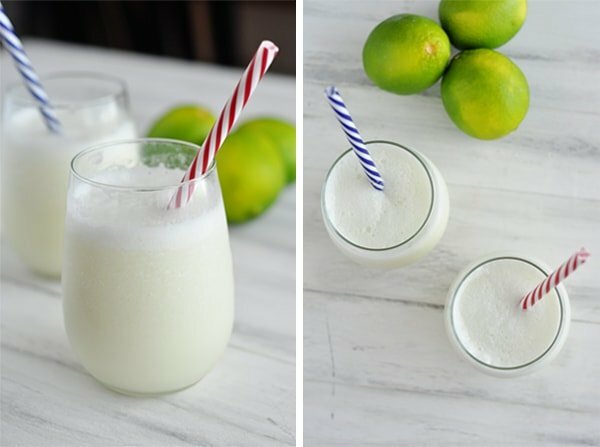 I mean, picture it: an icy cold, creamy, bold lime drink toned down with the gentle sweetness of condensed milk. Perfection? Perfection. I made this for the 4th of July last week (seriously mere hours after Ashleigh, a reader, sent it to me) and my kids are still talking about it and I’m still dreaming about it. I took sip after sip, closing my eyes and picturing myself on a remote beach in some tropically perfect location (jarred out of my reverie by the rowdies asking for me to please pass the pasta salad) and realized this drink may just be the happiness cement I need for the rest of summer in an insanely hot house packed with insanely energetic (but loveable) children. I’ll even consider doubling the batch so I don’t feel too badly about sharing. You know, because I’m nice like that. Cut the limes in half and squeeze out the juice. You should have approximately 1/2 cup juice. Keep the rinds and set the juice aside. To the blender, add the cold water, sugar, lime juice mixture, and sweetened condensed milk. Blend for 10-20 seconds. Add ice as desired: I added probably about 2-3 cups of ice - enough to make it cool and frosty but not thick like a smoothie. Blend until smooth. Add more sweetened condensed milk or sugar to taste, if needed. Serve immediately. This recipe can easily be halved! Large, juicy limes with thin skin are important here, otherwise the bitter taste of the lime rind will come through. So avoid those limes with bumpy, thick skin. To be safe, I'd buy 3 limes so in case they aren't as juicy as you think you can supplement the 1/2 cup juice with the 3rd lime (but don't blend up the rind of the 3rd lime if you have to get the juice out of it). You can add more sweetened condensed milk depending on how sweet and creamy you want the drink to be. Also, this drink doesn't fare well being made ahead but the beauty is it is so quick to make, you can make it right when you want to serve it! Next Post » Over 100 Recipes that Don’t Require an Oven! this is a huge hit in our family!! I can make any amounts of it and you can be sure it always gone and people are still asking for more… thanks for posting this awesome recipe..
I’d advise using juice of 3 limes, 1 cup sugar and 5 tbsp of sweetened condensed milk and only 2 of the lime rinds with thin skin to 2 cups of water…otherwise it’s just too sour. I am excited to make this recipe but I have a questions. I need to make this for a large family gathering. I don’t want to be mixing it in the blender for the entire party so I would like to make a large batch ahead of time. Any suggestions for me? Can I do it like one of those slush drinks where you freeze part and mix with the rest. Do you think the sweetened condensed milk will be ok if it was frozen or should I put that in at the end? Any suggestions? I haven’t made it in advance for the same logistical reasons, but I’m sure you could try! I like the idea of freezing part of it and mixing it with the rest. I’d probably go that route. I think the sweetened condensed milk should do just fine. I made this for my kids when they got home from school today,and it was a big hit! It’s quick and delicious! Two things I love 🙂 This reminded me of a frozen coconut limeade drink from The Smitten Kitchen. Which is also delicious,but my kids don’t like it. So ,I’ll be sticking to this recipe. I’m a bit late to the party, but HOLY COW! This drink is so delicious I had to comment!! My limes were about a week old…can’t wait to make this again with super fresh ones. Mmmm! Hi! I’m from Brazil and “Swiss lemonade” aka this recipe here is very used around the country. You only have to know it exists and order when you go to a restaurant. The juices usually are not listed on the menu so if you want this drink, just ask if they serve “limonada suiça”… big chances they do. Also, someone mentioned about the “lemonade” therm. “Lemons” in Brazil is Lime here (big confusion for me when I first moved to the US 🙂 – it’s not easy to find the yellow ones, your lemons here, and when we do, it is very expensive. It’s called Sicilian lemons! I’ve tried this with coconut milk (the thick kind in the mixed drink section). Soo delicious!!!! True story, we call it Swiss lemonade on Brazil! Well, it’s tasty anyway! If you wanna prove a real brazilian deliciousness, I would seriously recomend looking for “Brigadeiro”, a candy made out chocolate powder and sweetened condensed milk. On the rinds part, if I put 2 cups of water in, how do I only get 3/4 cups of liquid out? I got way more so I am worried it won’t taste right? My kids are running around the kitchen sword fighting and screaming, so maybe the answer is simple, but my brain cannot process it at the moment…. I’ve been following your blog (and cooking your recipes) for a while now. All I can say is THANK YOU! My family and I have loved everything we’ve tried from your blog (including this amazing Brazilian Lemonade). I’ve made this for years, but you’re right, it is way better to squeeze out the lime juice before. Instead of drinking just one cup, I drank 3! Yum! Thanks for the new version. That’s funny, I’m Brazilian and THIS recipe is actually called SWISS LEMONADE around here. Look delicious, but funny Im brazilian and never heard of it.And I live in the capital where we pretty much have a lil bit of the culture of the whole country. why haven’t I been making this ALL summer long!? It takes me to my happy place! I was viewing previous comments and one reader mentioned how her 8 year old loved it because the title lemonade (even though hes not a fan of limes) My 8 year old had opposite response…its good, but I was expecting lemonade mom. Whatever to the 8 year olds. This is yummy! I serve in margarita glass for added pizazz!!! MEL!! Made this last night. It was wonderful! Almost everyone (the silly 3 year old didn’t like it) LOVED it and asked for seconds. Thanks for your amazing site (it’s my go to) 🙂 Hope your finding ways to stay cool! YUMMY!! I loved it!!! Would it work with tequila? Hi Mel! My husband lived in Brazil for a couple years, too. I wonder if you would be interested in trying Pizza com chocolate na borda (pizza with chocolate in the crust)! He was introduced to it in brazil, and we made it for the first time last weekend. It was delicious– of course. Who can go wrong with pizza and chocolate? I just made our favorite homemade pizza recipe, and rolled dark chocolate chunks (private selection brand, although you could probably even make it work with chocolate chips) into the crust. Then, you have dessert at the end of every slice! I tried this and my daughters and I loooved it!! Thank you! Made it. My husband and I loved it. Made it again 🙂 Thanks! Can you make this with lemons? Mmmmm, so refreshing a yummy! A “must try” for this summer! I have never tried juicing the limes first. I think I found a perfect excuse to make it tomorrow. It is a family favorite! Stephanie and those wondering what to do with sweetened condesned milk.. Put it in iced coffee or iced tea! Or drizzle it on pancakes (thats how they sere pancakes here in Mexico) . Or spread it on toast. I usually don’t post unless I have something helpful to say for other readers – but this time I just want to say: WOW! So so good! I told my husband that I felt like I was at a resort in the tropics somewhere – it just felt so luxurious to be drinking something like this! I’m looking at my leftover sweetened condensed milk and lime rind-water wondering if I should just make another batch right now! (ps, what DO I do with the rest of my sweetened condensed milk??). Stephanie (and others that asked) – if I haven’t used the entire can of sweetened condensed milk, I store the leftovers in the fridge and use it for recipes like this that just need a little bit or add it to my next batch of dulce de leche. Is it bad that I never have a problem using it up?? This is truly the best summer go-to drink ever!!! I call it my happy juice because when it’s hot, i get crabby and this drink will make me happy every single time. lol My kids will even ask for it by that name. 🙂 I’m so glad you enjoyed it. This drink is served at Tucanos here in the West. It’s a Brazillian restaurant, but as previously mention, the drink may not be authentic. Either way, it’s amazing! I made this and it was delicious! Thanks! We didn’t drink it all so I make the rest into popsicles and they were a hit today! Thanks so much! I was just wondering if you have any ideas/suggestions/recipes to use up the rest of the sweetened condensed milk? Not sure what to do with it. Emily – it’s ok if you have more liquid. It can depend on a lot of factors like the size of your limes – not all 2 cups of the liquid will strain out thanks to all the pulp. I don’t think you are doing anything wrong – just taste the finished blended drink to make sure it is sweet enough. I make this too, but a little differently. I slice the limes into about 6 slices and throw everything into the blender. Then pulse it 5 times (any more than 5 would be too much). Strain and serve immediately. Love it. This stuff is sooo good! I also lived in Brazil for a few years like your husband. I lived in the state of Minas Gerais and I had this lemonade all the time. So at least in Minas, this is very authentic. Except the brazilians called it “limonada suica” (Swiss lemonade)! Just made these for the family after a couple of hours of yardwork in the Texas heat…. they were a huge hit!!! And my lime hating son slurped it up cause it was called lemonade. 🙂 8 year old boys can be ridiculous at times, ha! Thanks so much for sharing – I don’t read other cooking blogs so I’m glad you shared! 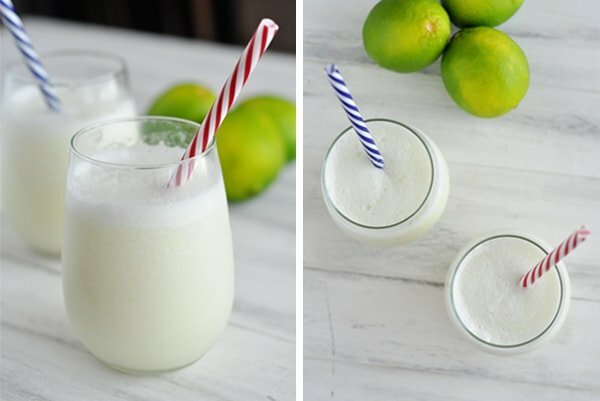 If you can get your hands on key limes those would be delish for this recipe! They are slightly less bitter and so refreshing. I can’t wait to try this, thx! 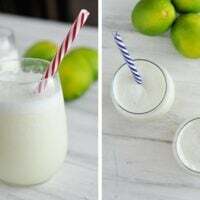 I’m a huge lime fan so I can’t wait to try out this recipe!! I love the straws in your photograph. Any hints on where to get some? Also, this is my all time favorite drink too! Thanks so much for posting such a great recipe. Andrea – I found those little striped straws in a clearance bin at Shopko and I don’t even remember the brand. I’m sorry! I’ve seen straws like this all over the web and googling for them might turn up some great results. This sounds fabulous! Love anything with lime in it! Will any blender work with those rinds or do you need a Blendtec or Vitamix? Sounds yummy! Angela – no, you don’t need a super powered Blendtec or Vitamix. Any decent blender should do the trick. I was introduced to this recipe earlier this summer and have tried it a couple ways. I don’t juice the limes before blending and don’t blend the rinds for an entire minute either. Really a few pulses, maybe 10-20 seconds is plenty, anything longer cause the mix to be bitter. I served these at a party and everyone went nuts over them wanting the recipe. It’s my current favorite recipe so was excited to see your post this morning. …. recipe on the email and your blog are still not in synch. The one in the email did not make sense so I came to the site and it is much clearer. This sounds great. I’m a great fan of limes and just cleaned my pantry out and found a small can of sweetened condensed milk, so I’m ‘on’ for the weekend! thanks for your recipes! even the ones I never cook or contemplate cooking are great! Ahhh I need to go get some limes asap so I can make this!!!! This is DELICIOUS!!! I have about 30 frozen juiced lime halves in the freezer that I save for cleaning my garbage disposal… I may have to figure out how to sub in Key Lime Juice to make up for the lack of juice left in the limes 😉 I love this! I love lime and this sounds delicious. Just need to get some sweetened condensed milk. Oh, and more limes. They serve this at Tucanos, a Brazilian restaurant, so it must be authentic to somewhere in the country. I’ve also tried it with either strawberries, papaya, pineapple or mango. Yum! We have been making the Our Best Bites version of this for a few years and love it! This sounds easier though. I have limes ready to go, and this will be wonderful in our 100 degree day today! Thanks! 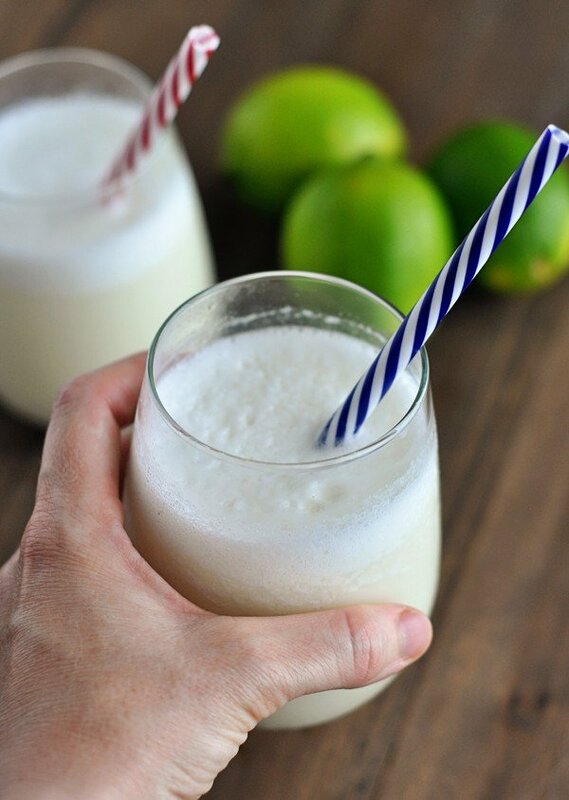 I am wondering if in a pinch if I could switch out frozen limeade for some of the ingredients? I prepare 3 gallons of a cold drink for my clients at a remote location w/o a blender..
Oh man does that look good, Mel! I’m giving the weather in Austin about 10 more minutes til it hits triple digits and I’ll be REALLY lusting after this drink. Saving for future reference! Thanks for sharing. Sounds almost like having key lime pie…. I will definitely have to try this… Maybe this will be my drink of choice on the island in 2 weeks.. Thanks, for another lime juicing drink Ashleigh. we are having this with bbq dinner tonight! Sounds delightful… but I’m a limeaid addict as it is! Thanks so much for this great recipe!!! I feel silly asking, but does the 1/2 cup juice and the 3/4 cup liquid both go back into the blender with the rest of the ingredients? Sounds like a fun recipe! I haven’t had my coffee yet, so maybe I’m missing something, but I don’t think the recipe tells you what to do with the lime juice. I’m assuming you blend it with the sweetened condensed milk? Sounds really interesting; I’ll have to try it. I’m imagining this tasting like drinkable Key Lime Pie. In other words, like the best thing on earth. As an FYI: I’ve seen this recipe going wild around the internet lately. The difference in the version I posted today and the others that I’ve seen is that you juice the limes before blending the rinds with water. I’ve tried both versions and the reason I like this one (thanks again to Ashleigh for introducing it to me) is that it is less bitter than the ones where the limes are all blended before juicing. I made this for a Brazilian friend and she had never had it or heard of it either. But she did explain why its called lemonade but is made with limes…..she said they don’t have separate words for a lemon vs. a lime. Instead they distinguish the two by describing the color — yellow lemon or green lemon. Anyway, we both really enjoyed it….what’s not to love? Its lime juice mixed with sweetened condensed milk!! I love this recipe. I’ve been making it for a while now. I think I first saw it on Our Best Bites or Sisters Cafe blogs (or both). Delicious and so refreshing! I am definitely using this recipe for a pool party tomorrow! Just in time 🙂 Thank you! !